ThinkGeek has created a lovely miniature cake pan that creates small cakes shaped like a d20 die. Each mold creates four 3″ cakes, and ThinkGeek suggests using a recipe with yeast for the best results. 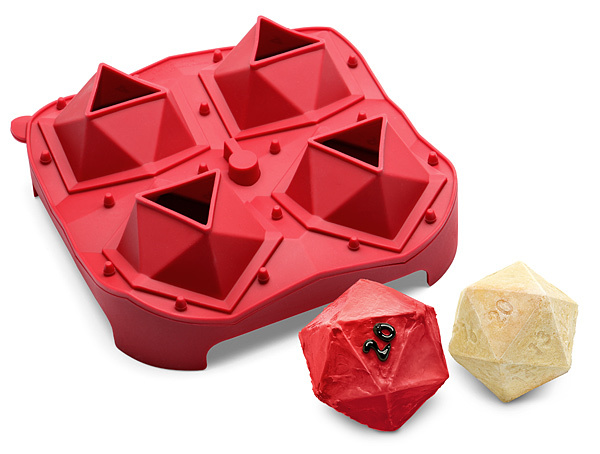 Each d20 Critical Hit Mini Cake Pan makes 4 d20s at a time which each measure 3″ across. They work with any store-bought mix or recipe from scratch, but we suggest something with yeast to take advantage of the mold’s unique construction. Put the mold on a pan before sticking it in the oven to stabilize it, and bake according to the recipe instructions. Just keep an eye on it while you bake with it the first time in case you need to adjust a bit. Sort of like you’d keep an eye on a new NPC joining the party, in case he or she needs *ahem* adjusting.